Ever since the night of the incident with Luke Willis, the preacher’s son, sophomore Hallelujah Calhoun has been silent. When the rumors swirled around school, she was silent. When her parents grounded her, she was silent. When her friends abandoned her … silent. Now, six months later, on a youth group retreat in the Smoky Mountains, Hallie still can’t find a voice to answer the taunting. Shame and embarrassment haunt her, while Luke keeps coming up with new ways to humiliate her. Not even meeting Rachel, an outgoing newcomer who isn’t aware of her past, can pull Hallie out of her shell. Being on the defensive for so long has left her raw, and she doesn’t know who to trust. On a group hike, the incessant bullying pushes Hallie to her limit. When Hallie, Rachel, and Hallie’s former friend Jonah get separated from the rest of the group, the situation quickly turns dire. Stranded in the wilderness, the three have no choice but to band together. The thing that interested me most about The Distance Between Lost and Found was the storyline. Three kids lost in the wilderness? It sounded like it would be a really interesting read, and it was. After an incident with the preacher’s son leaves her the object of vicious rumors, Hallelujah Calhoun has kept her silence. Why not, when no one believes her about what happens anyways? But when a youth group field trip goes wrong, and Hallie finds herself lost in the woods with two other kids from her group, she’s forced to learn to trust again, in order to survive. Hallie was an interesting character to read about. I sympathized with her for what she went through with the preacher’s son, and not only for the main incident that started all the rumors, but for everything that he had put her through since. But it did really bother me that she didn’t speak up sooner. (Of course, I realize that if she had spoken up sooner, there wouldn’t be a story…) I just really wished that she would have stood up for herself sooner and saved herself from all the misery and heartbreak that she incurred. Despite this, it was interesting to watch Hallie grow and find herself throughout the story. The two other teens that Hallie was lost in the woods with were Jonah, and Rachel. Rachel was a really cool character, and I love how she worked to bring Hallie out of her shell. Jonah, who was Hallie’s friend in the past, and is also friends with the preacher’s son, was interesting as well. There were so many things about him that were likeable. All three characters worked really well together. The storyline mainly revolves around Hallie finding herself and finding God, learning out to trust again and finding her strength while trying to survive in the woods. And she does this with help from Jonah and Rachel. I have to say, the times that they spent in the woods would have been truly terrifying, especially for some of the things that happened while they were out there, I really don’t think I could have made it! 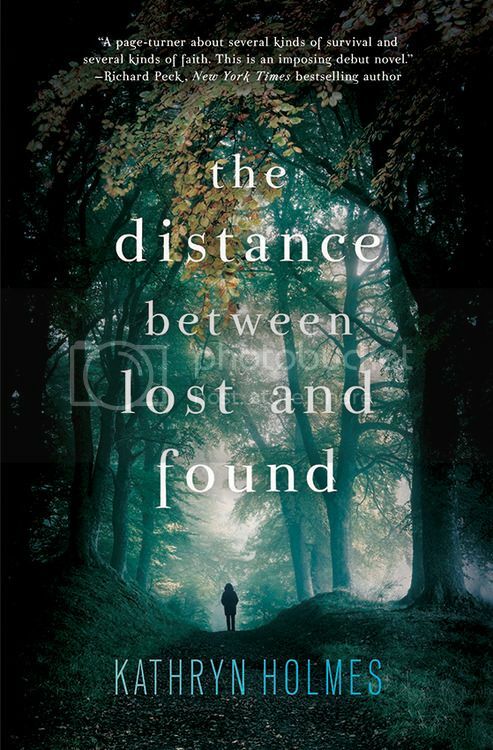 Overall; The Distance Between Lost and Found was a very interesting read. I’m really looking forward to reading more by Kathryn Holmes in the future. Falling for Alice: Cover Reveal and Giveaway! Please check out my updated POLICIES page! I am now accepting Instagram and Audiobook inquires! Some photos are not showing up on older posts due to a hosting issue. I am working to fix this! Sorry for the inconvenience. Christy (TheReaderBee) has read 92 books toward her goal of 150 books. Blog Design and ALL Reviews on this site are copyright of TheReaderBee.com. Powered by Blogger.